So in what way is outback driving different? As soon as you leave the civilisation behind - it's funny how people become friendlier towards strangers as soon as there are less people around. 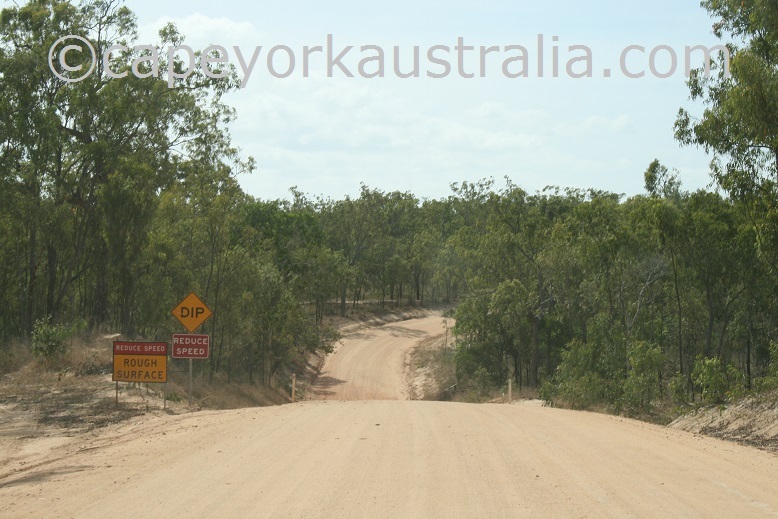 I love driving in the outback even outside Cape York, and am known to take off on crazy trips to places like Broome or Queensland outback on my own. 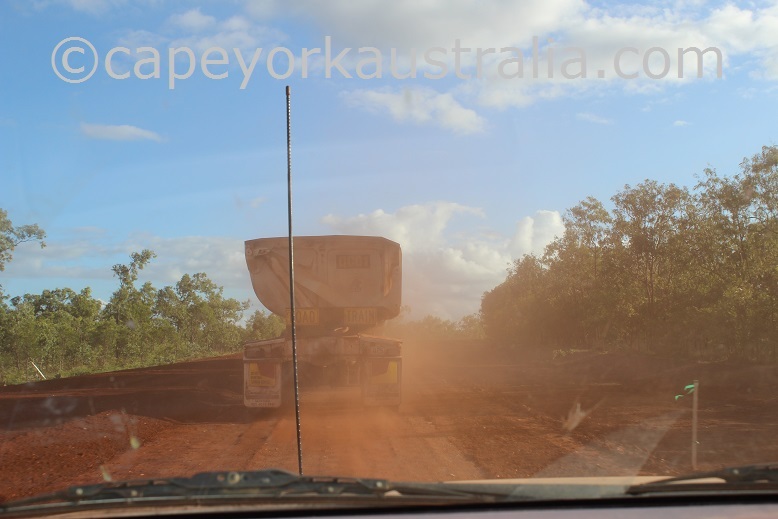 And that's not the only fun thing about outback driving! 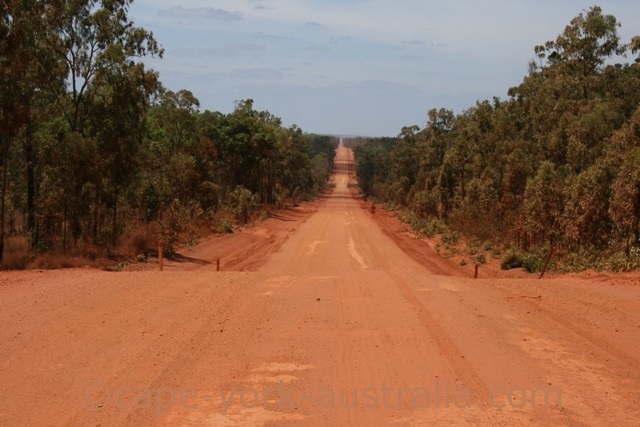 The outback is the most exciting part of Australia - the unknown country to a lot of people. But there are also a few things that are good to be aware of and bear in mind. 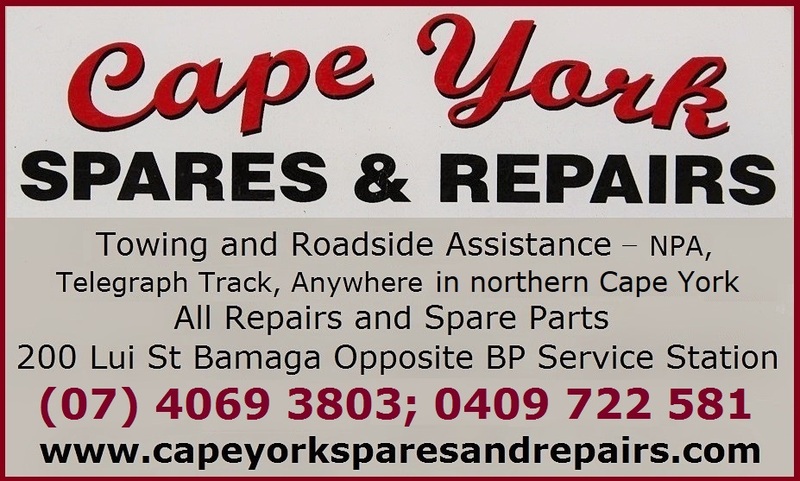 Distances are long in Cape York and elsewhere in Australia, and there are signs encouraging tired drivers to have a break. 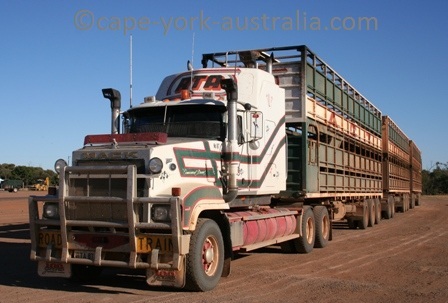 Another outback driving thing is the road trains. 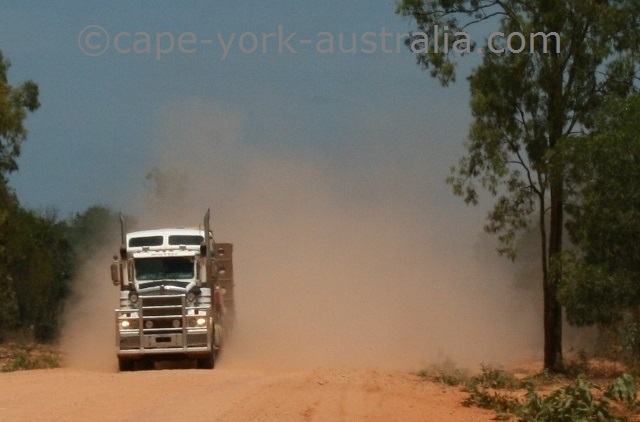 They are up to 50m long trucks, which stir up a huge cloud of bulldust on unsealed roads, and can be dangerous to overtake because of their length. 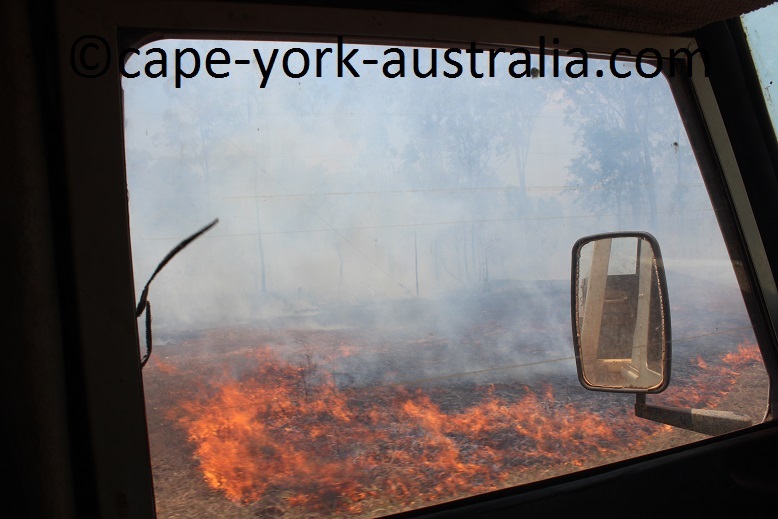 There can be bushfires, but these are worse in the southern parts of Australia, where the heat is drier. Our climate up here is too moist for really big bushfires. You do get fires here and there, but they are not as big and violent. 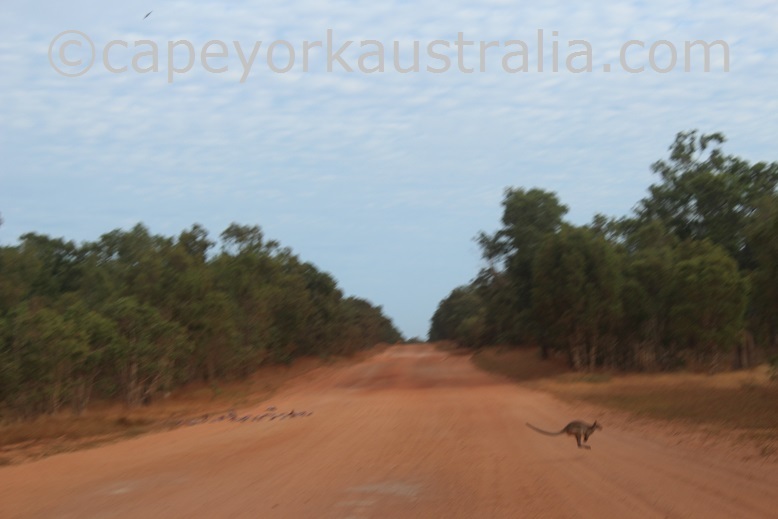 Also on the outback roads, of course there is always the wildlife. The most common are kangaroos and wallabies that hop across the roads, but you do also see other animals like dingoes, wild pigs and others. 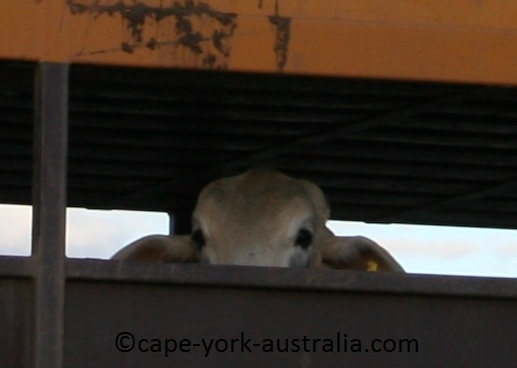 And up here, to the surprise of many from southern Australia - cattle can roam freely on the road. They are not there by accident, they are on some roadsides all the time, simply because they are not fenced in. 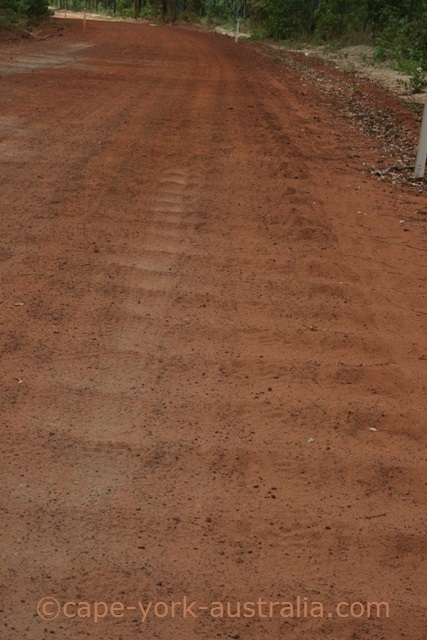 Another thing we have a lot of in Queensland, are metre marks on the roadsides in the areas that get flooded. During the Dry season it looks like they don't make sense, but during the Wet they do. 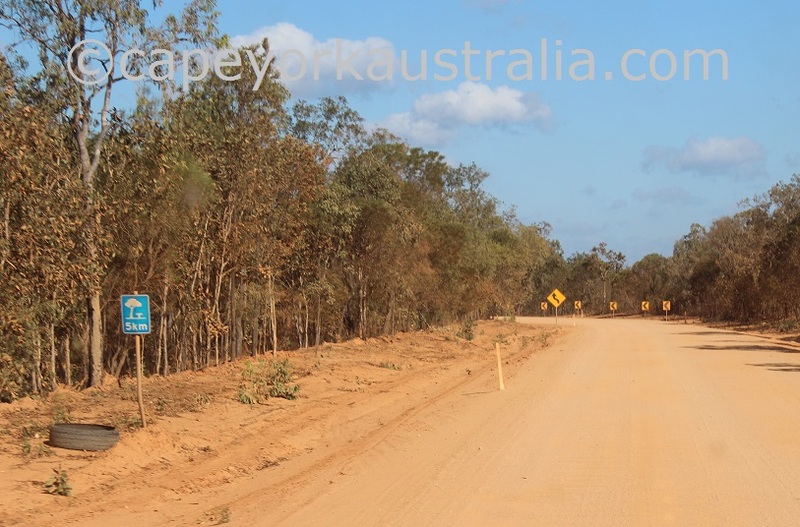 And another thing we have a lot of in Cape York are corrugations. 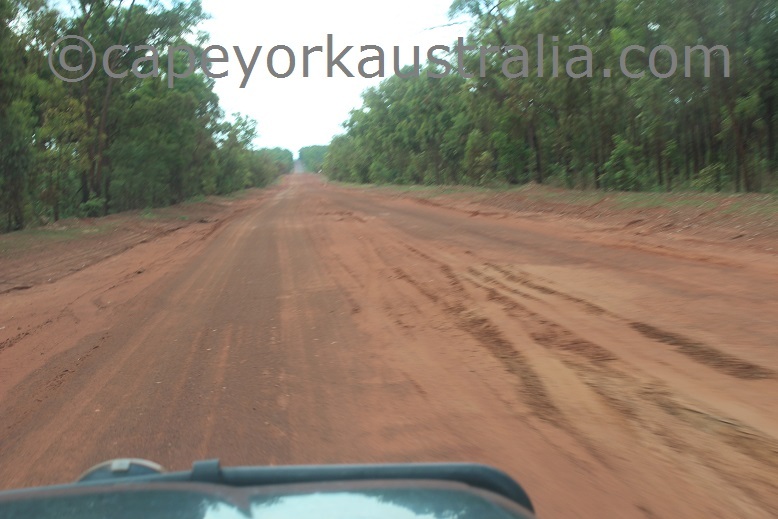 They can be everywhere on unsealed roads, but in Cape York, they could be worse than you are used to in other places. 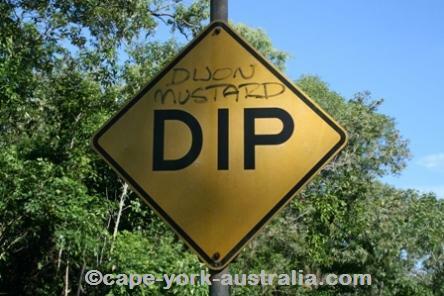 Another common thing that you will see is DIP signs. The dips vary from almost unnoticeable to the ones that damage your vehicle if driven through too quickly. 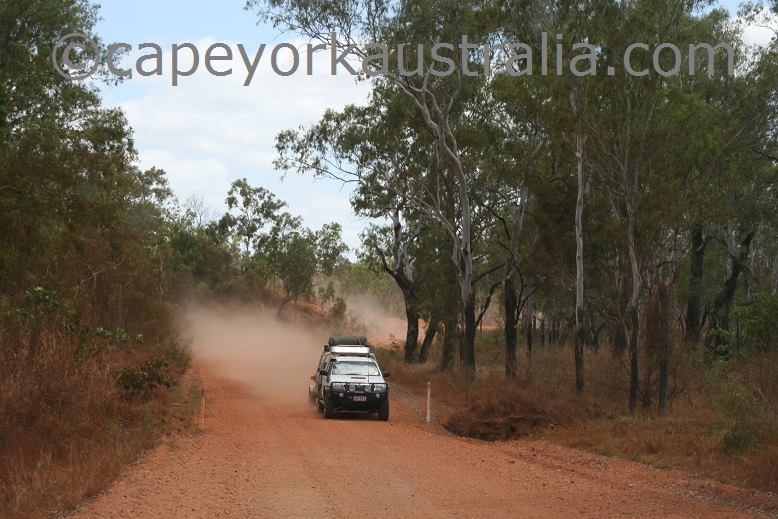 During the Dry season, Cape York roads are dusty, and there are some quite bad dust holes to watch out for. On these roads, passing vehicles stir up bulldust - impossible to see through. 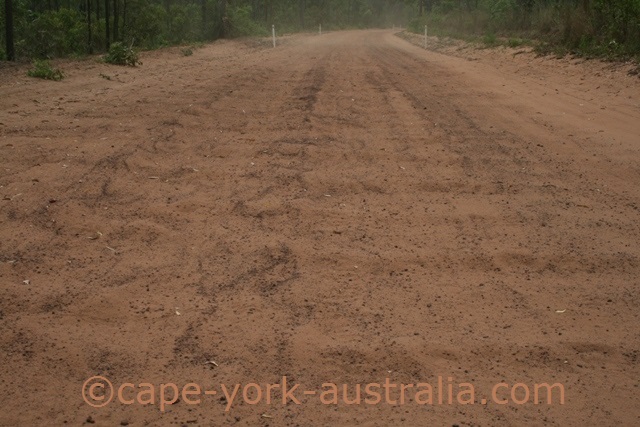 We also have some roads with very soft sand - easy to get bogged. 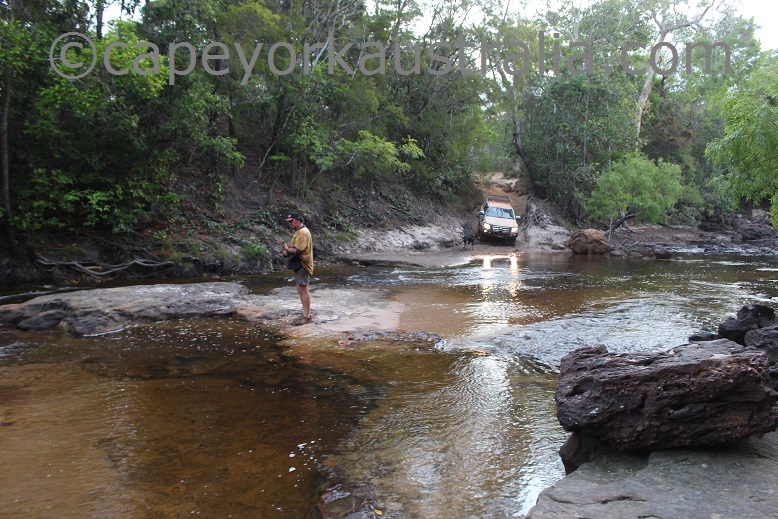 And what we do have more of than southern Australia is the drives with creek crossings. 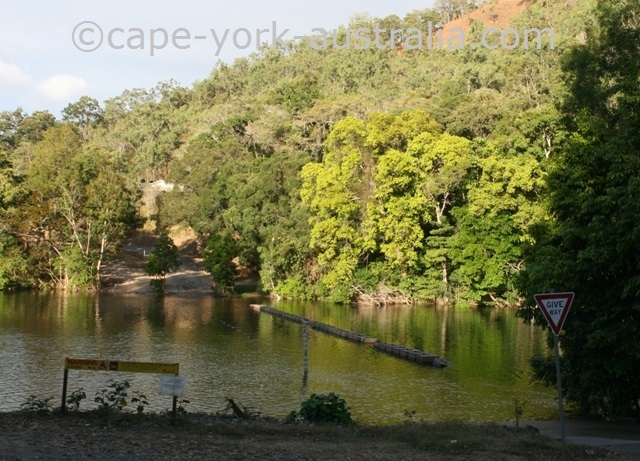 There are even some river crossings such as Daintree, Bloomfield (UPDATE Bloomfield now getting a bridge - May 2014), Wenlock, Pascoe and others. Jardine Old Ford is doable, but I would definitely not recommend it unless you really know what you are doing. In the early and late Dry season you have more chances for rains, which can make the roads soggy (even boggy) and slippery. 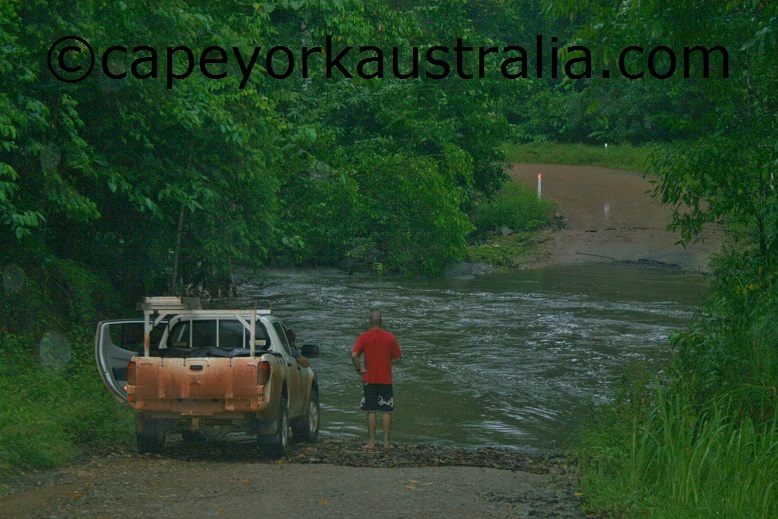 The same can happen to creek crossings - if it rains a lot in a short time they can quickly become impassable. The photo above left me stranded for nine hours until we finally got through. 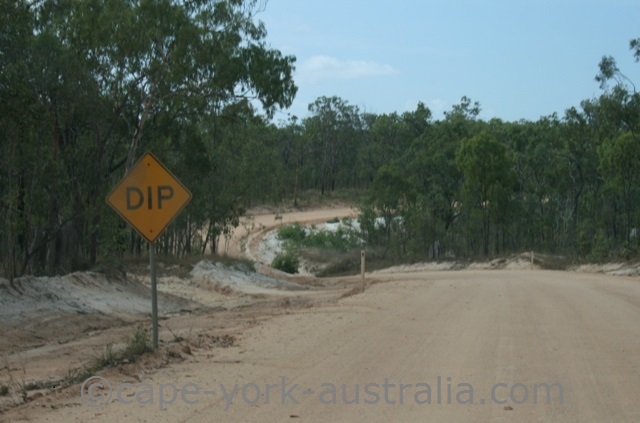 If there is one thing you see often in Cape York, it's the dip sign. And I am not alone - some other people have thought of bacon, chilli, even skinny dip and written them on the signs. 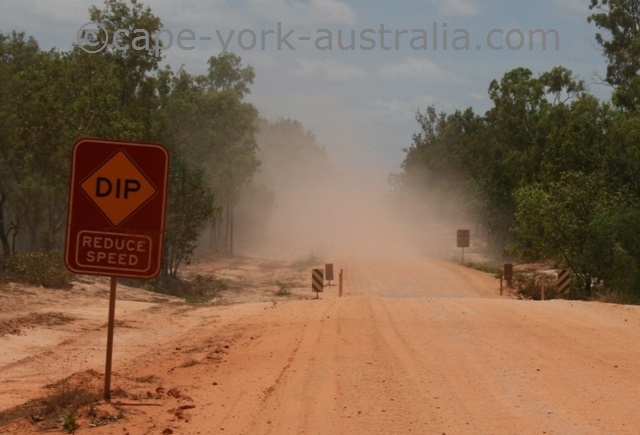 They are silly jokes really, but on the right moods in Cape York, you be surprised how easy it is to laugh at anything! There are surely as many different dips as the ideas for the silly signs. Some are hardly noticeable, others are major dips, which can cause an accident if you speed through them, or at least seriously damage your vehicle. The thing is you don't know before you drive through it so before you start laughing, slow down at each dip sign and take it easy while driving through it. 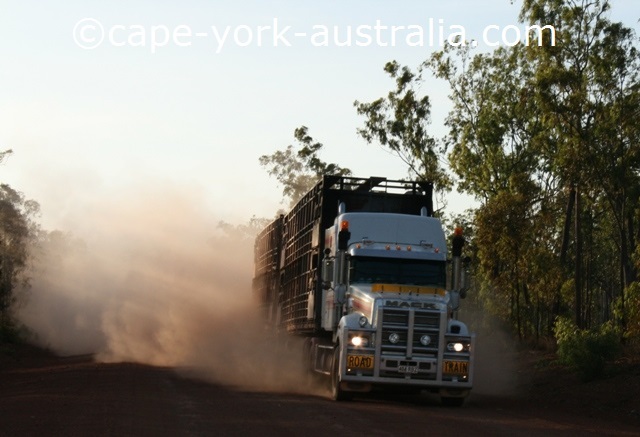 There are so many of them that you find sayings like "Six Thousand Corrugations to Go..." on Cape York souvenirs. Corrugated roads are not only annoying but also damaging to your vehicle. 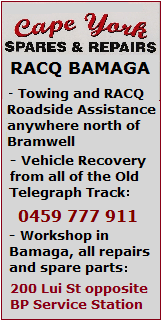 Makes you want to do the Old Telegraph Track twice instead of putting up with them on the Bypass Roads. 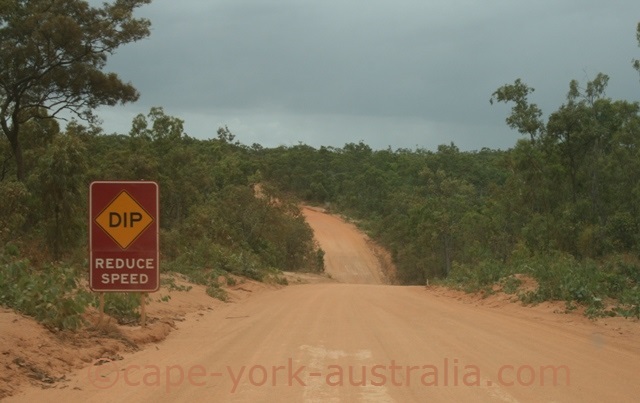 But the thing is - that won't make you avoid them on your Cape York trip. 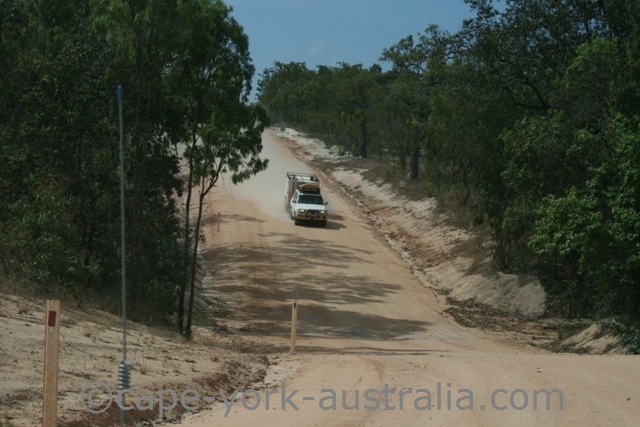 Apart from the Bypass Roads, there is the Telegraph Road, there is the Peninsula Developmental, the roads through Lakefield national park, and so on - any unsealed road gets corrugated after a certain amount of traffic has passed, particularly the big heavy trucks. I've been asked by readers whether there is any sceduled dates for grading, obviously trying to plan their trip so they can avoid corrugations. The council guys simply drive the roads to see how bad they are, and if they get bad enough, they are graded. Impossible for us to predict anything here. You simply have to count on slim chances you can avoid it, so.. 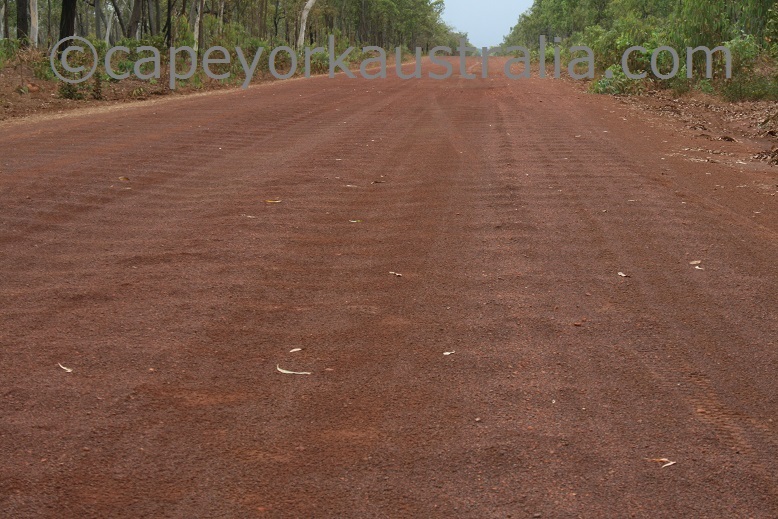 When you drive on corrugations you soon notice that they are worse when you go slower. So one trick is to go quicker and "fly on the top of them". This can be dangerous though, as it makes it harder to keep traction, and you may lose control of your vehicle. You have to find the right speed, which can be a fine line between feeling less of the bumps and losing control. Another trick that helps you to feel the bumps less is to let your tyre pressures down. It makes the drive far more comfortable. The downside of letting the tyres down is that you get a puncture easier should you run over something sharp, so watch out for any of that including rocks. Something that helps you to keep traction is engaging your four wheel drive. 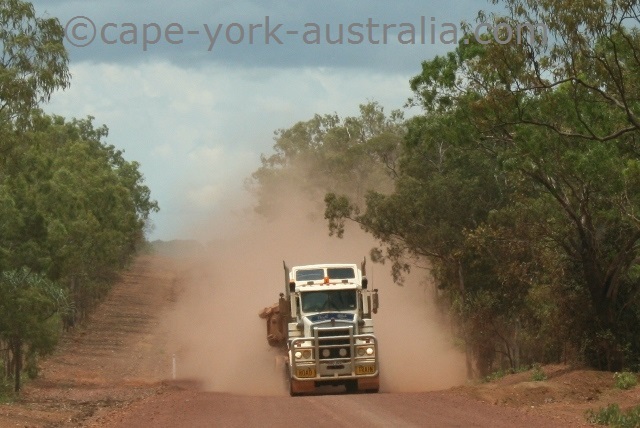 It is generally not needed on those roads, but if you want to go quicker on corrugations and be as safe as possible it does help - four wheels are working instead of two. The downside is that four wheel driving uses a bit more fuel. I don't remember where I read it but someone said you can put your washing into a well sealed bucket with washing powder and water, and it works as a perfect washing machine! 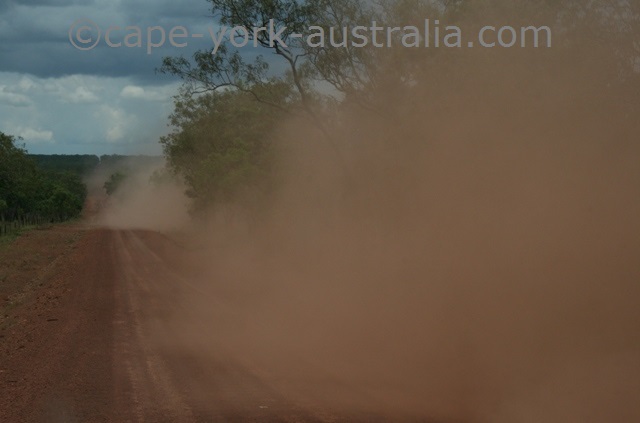 There is a fair bit of bulldust on the Cape York roads. Even if you don't notice it that much on your trip, you sure know about it once you are back home and have to clean your vehicle! Both inside and outside have become red and covered in fine dust that has gone into every single crack. Well mine is covered inside anyway, because my air conditioner is constantly broken so I have to drive with windows open to get a bit of breeze in - that, of course, also brings in a lot of dust. 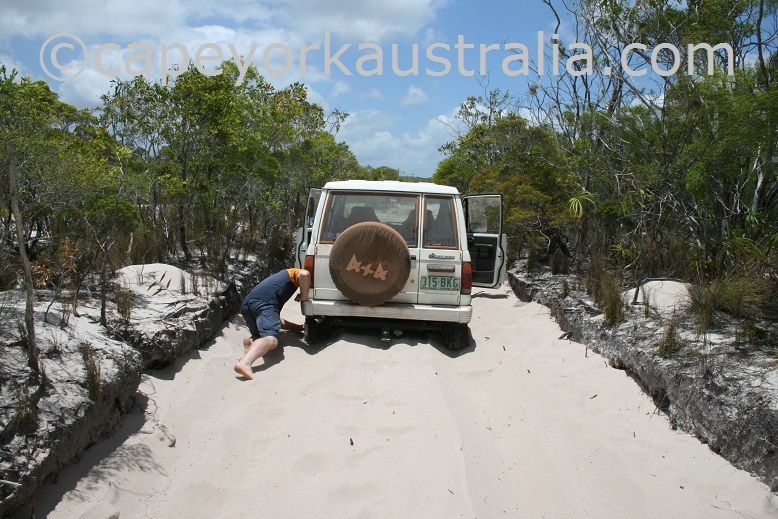 It's one of those things on your Cape York trip.. and it most likely won't go unnoticed! It may a passing or overtaking vehicle that stears it up, or it may be yourself while driving through some real dustholes. Whatever the case, it is really fine, it does not only go into your eyes and nose but also your camera (it broke my SLR camera on one of my trips), your laptop, everything. Be better than me at keeping your air conditioner working so that you are comfortable to drive with windows closed. Even when I drive with the windows open, I do close them when I pass another vehicle - this is when most dust is steared up. It doesn't help fully, but it stops a big junk of bulldust from coming in. If you have anything in the car that you don't want to lose, cover it. It will go into your computer and your expensive camera, as well as torch, iPod, iPad, backup devices - anything electronical is really sensitive to the dust and they are usually the things that are expensive. If you have an SLR camera, don't change lenses while the dust is coming in through your window - this is written from first hand experience and this was how I got my own camera broken. It is also a good idea to have a sheet or something just to throw over everything in the back of the vehicle. Nothing stops it fully but every little bit helps. 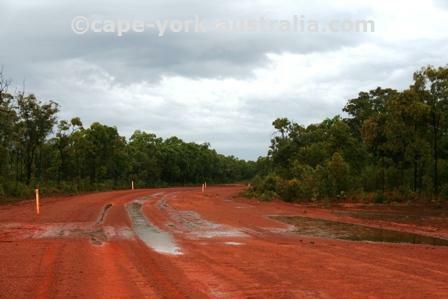 If you have shoes or clothes that you absolutely love, DON'T bring them to Cape York. Before I learned this, I lost a lot of them to bulldust - it makes them red and you never get it out by washing. Wear clothes and shoes that you are looking forward to get rid of - at least if you travel like me, rough it, and don't generally make an effort to keep out of dust (and it is not really possible anyway). ... is to drive through bulldust. If you cannot see through it, don't drive through it. Stop your vehicle and wait until it goes away. Also, try not to speed. 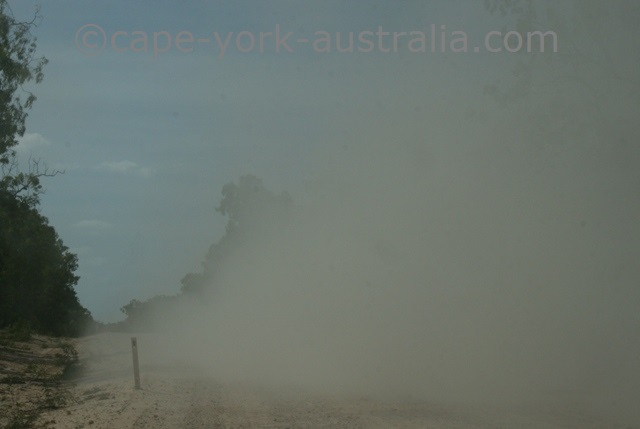 Watch out for dust holes and take it easy when driving through them. They can be hard to see but they can damage your vehicle quite a bit if you drive through them too quick. And last but not least - during your trip, don't think about getting back home and having to clean every single item from bulldust - it is bad enough once you have to face it! Here is how easy you get a broken windscreen...... and not only that - with some bad luck even risk your life! 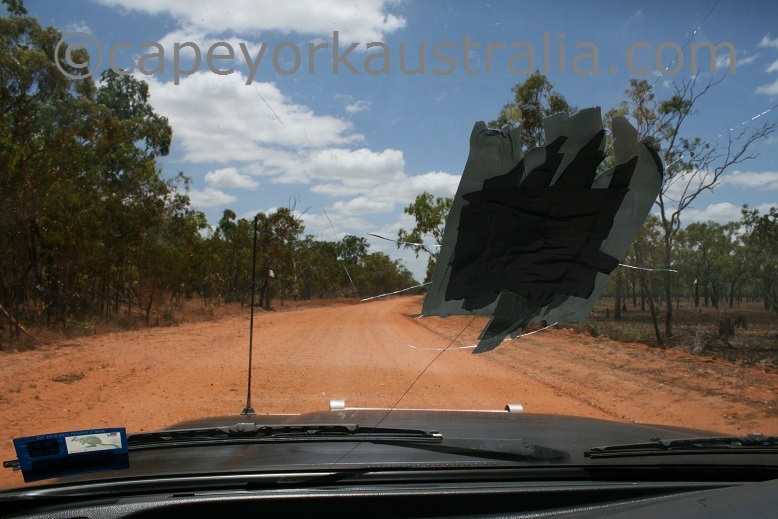 I have been driving on those roads for years and years, in different vehicles, different conditions, different seasons, without ever putting a lot of thought into getting a rock fly through your windscreen. Well it's quite an extreme thought, isn't it? With a bit of bad luck, it can be very real! 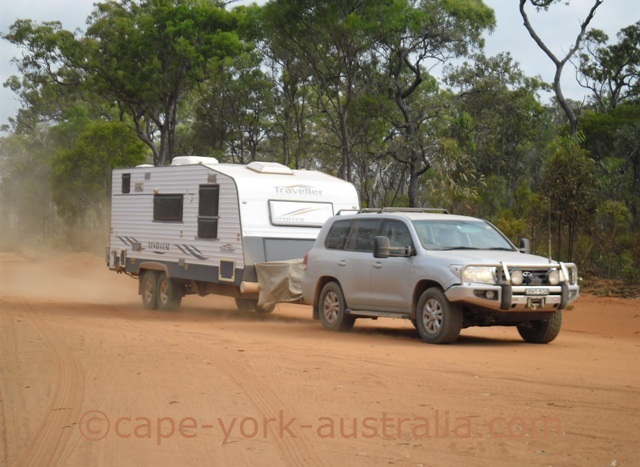 In 2012, while driving through Lakefield National Park, it was the reality for me, and my 'bad luck' turned out to be a really GOOD luck to be alive! Sitting in the passenger seat, with nothing much to do I clicked away snapping photos on this and that, including passing cars coming from the opposite direction. I still had the camera in front of my face so I didn't see the rock coming but I sure heard it! The windscreen JUST held it. And think if the windscreens weren't laminated! 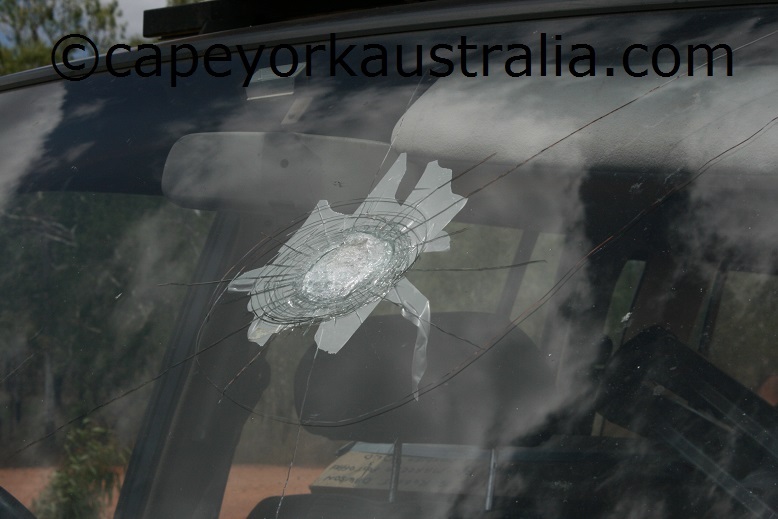 This rock was coming right at me, and when we later told and showed other people what happened, we heard true stories about people being killed by rocks coming through windscreens. Why Do You Get a Broken Windscreen from Rocks? How do rocks this big fly that high? It happens when people simply don't care to slow down when they are passing other vehicles on unsealed roads. Please, people, slow down when passing other vehicles on dirt roads!!! You may not only cause people costs of hundereds of dollars to replace their broken windscreen.. you may actually kill someone with a bit of bad luck! 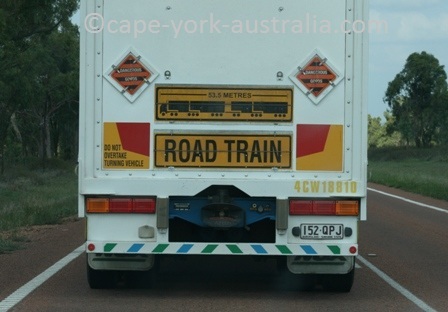 Australian road trains didn't get their name for nothing. 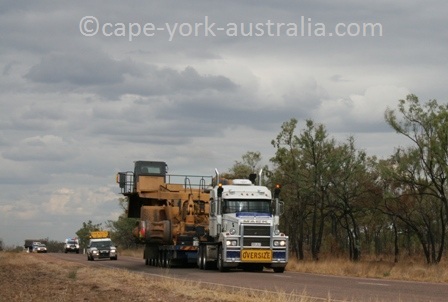 They are huge trucks that can be up to 55 metres long. That's a very long vehicle - more than double in length compared to the longest ones in Europe! You don't see them in cities and the more populated south eastern areas of Australia. You see them in less populated areas, where distances between places become longer. They are very common in Western Ausralia, Northern Territory, and outback Queensland. 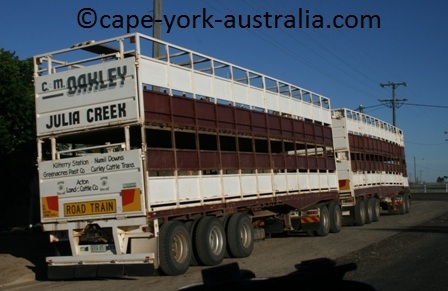 I remember taking photos of my first Australian road trains in Western Australia. 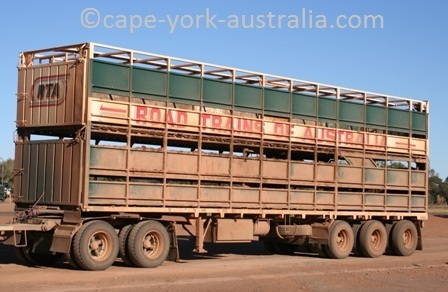 After having been living in northern Queensland outback for many years, I am so used to them it's hard to picture a road without road trains. But being so long and so heavy, they can be dangerous. 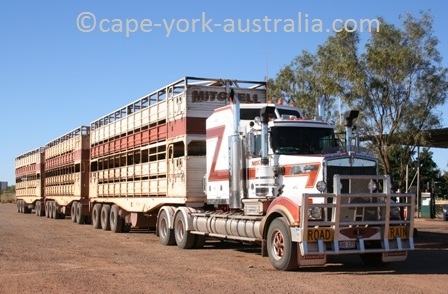 There are a lot of different kinds of Australian road trains. 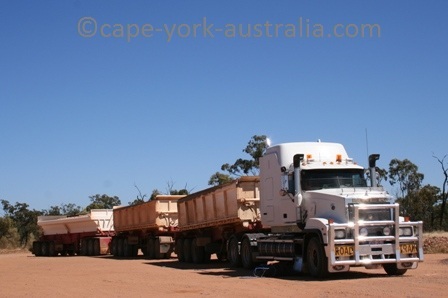 Some are mining trucks, others are cattle trucks, yet others may carry fuel or machinery... and depending on what they carry, they are all different in shapes and sizes, number of trailers and of course, length. Depending on all that, they also have different names like triples and quadruples but I won't get into such detail here. You'd be more interested in reading about how they can be dangerous to you. 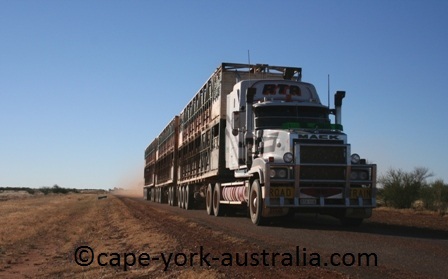 There are a few narrow roads in the outback that are used by Australian road trains. 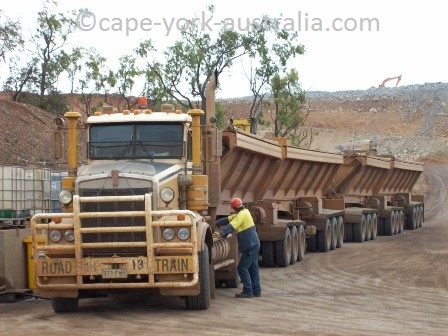 Some mines can be reached by small roads only, but mining trucks need to get in there. 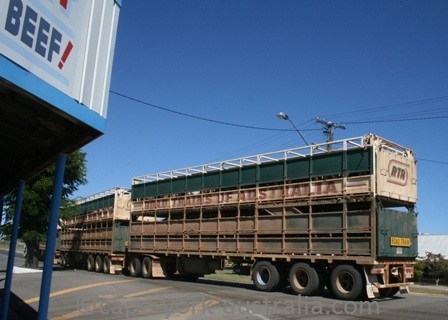 Same with cattle stations and cattle trucks, and all others. 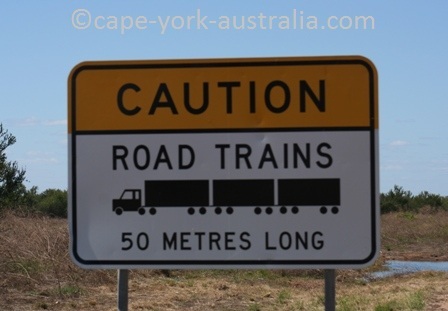 There are normally road signs, but you can also get an odd road train where there are no signs. 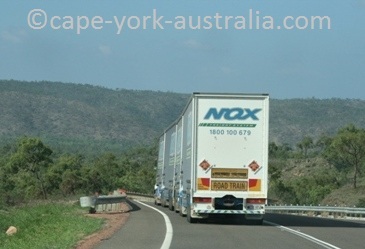 Why narrow roads are dangerous is that sometimes there is not enough room for two vehicles to pass each other, not at least if one of them is the size of a road train. 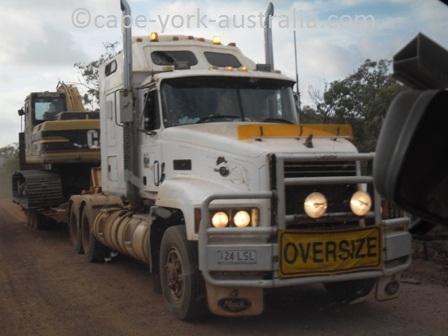 Because they are so large they are also very heavy and they drive in the middle of narrow roads, and if only the middle part is sealed (which is the case with many narrow outback roads in Queensland), this is where they will drive. When you are meeting them you will have to pull in. They will not get off the road for you - not out of ignorance but because they cannot make movements quick enough - they are too heavy. So keep your eyes open, be prepeared to pull in quickly, if you have an UHF radio, have it on channel 40 and listen. 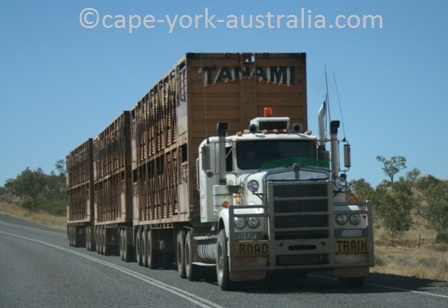 The biggest danger is overtaking Australian road trains. 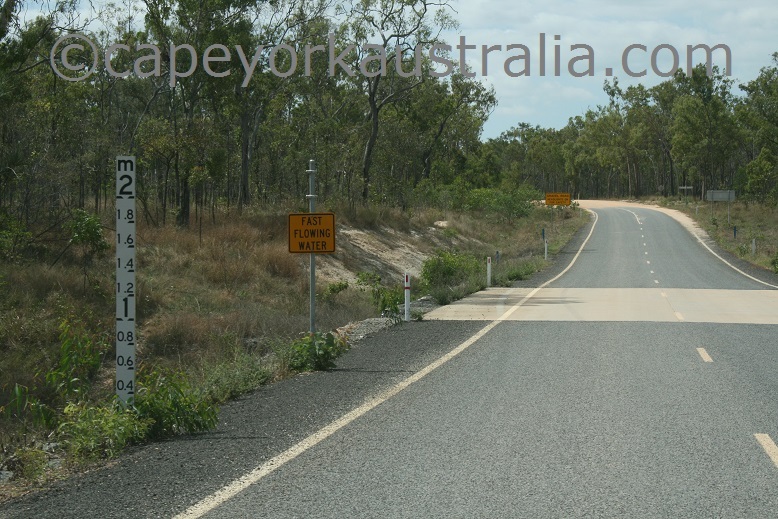 They are going slowly, in Queensland they are only allowed to drive in 90km/h max. So they can be very annoying on a road where you are allowed to go in 110km/h and particularly if you are in a hurry... which I always seem to be. But being in a hurry most often only happens to locals.. If you are a traveller, and not used to overtaking them, simply pull in, have a rest and let it go. You got the time so it's not worth the risk. They are as long as about 10 cars, so it takes you a while to overtake one. Unless you have a looooong strait non-hilly road and can see well ahead, this is a very dangerous overtaking. You also want a broad road so that you can have a good distance from it side-ways - because they often sway from side to side (last trailers most). And remember one thing - because they are so heavy, they go slowly uphill and fast downhill. It is quite easy to overtake them when they slowly climb uphill.. but never do it when they go downhill! I have seen photos of small cars crushed just after overtaking them and then turning back to the lane in front of them. They are that heavy they cannot stop themselves when going downhill, and it takes them a long time to slow down. 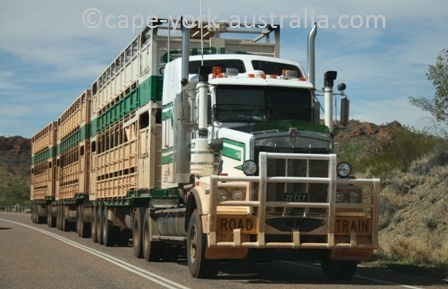 I avoid overtaking Australian road trains as much as I can. I have to be in a great hurry to do it - if only I can, I pull in and let it go instead. On some roads you also have overtaking lanes, which makes it heaps safer. 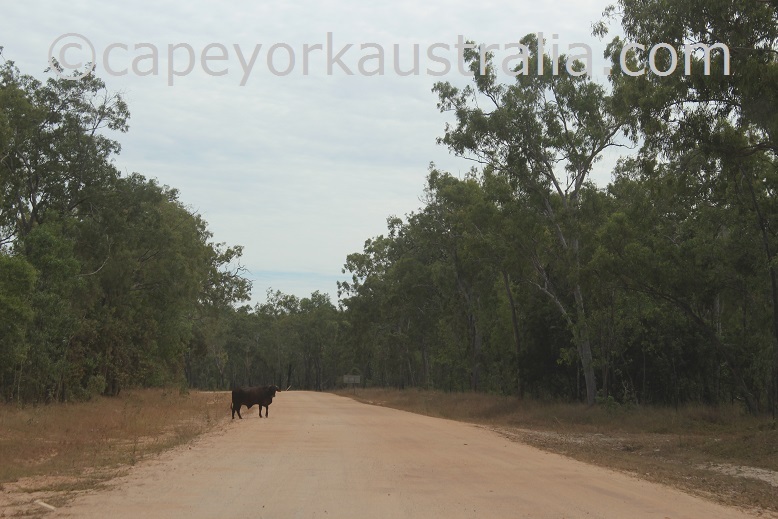 But these tend to be on the coastal Bruce Highway and not so much in every outback road. 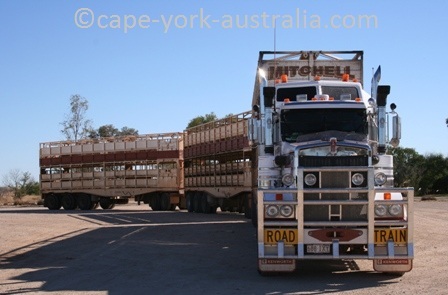 I have once, in Northern Territory where we are allowed to drive in 130km/h, been almost killed by a small truck driver overtaking a road train and not seeing me coming from the opposite direction because the road was hilly. If I didn't make the millisecond move to pull in before I even had the time to check what the road-side was like, we would have had a head on collision and I wouldn't be here writing this today. When they passed me where I stopped he was in my lane, still overtaking the road train... and waved a 'sorry' -- for almost killing me! That also shows you that you have to be alert driving and try to see things in time. I had no time to waste - it was a very near miss that left me shaking where I stopped for a long time. The reason why it didn't take me any time to pull in was that I had previously thought about the situation. And thought that no matter what's along the roadside, even if I rolled over, is better than a head-on. So when the situation was there I didn't have to make a decision - I had already done it before. It was a horrible experience that I wish to no-one so take care.